The Catholic Church in America is deeply divided, and gender issues (especially reproductive choice and women's ordination) have become a symptom of this division. This paper examines the language used by liberal and conservative Catholic women to talk about gender. It is argued that although similar divisions over gender exist within Protestantism and Judaism, Catholic women are in a unique position to confront them, Unlike conservative Protestants and Jews who have separated themselves from their more liberal counterparts by forming independent Evangelical and Orthodox denominations, conservative Catholics co-exist with liberals in the mine church. The paper shows that being forced to confront those divisions has resulted in a tendency towards polarization on the one hand, and towards moderation on the other, both of which have important implications for the future of the Catholic Church. Manning, Christel J. 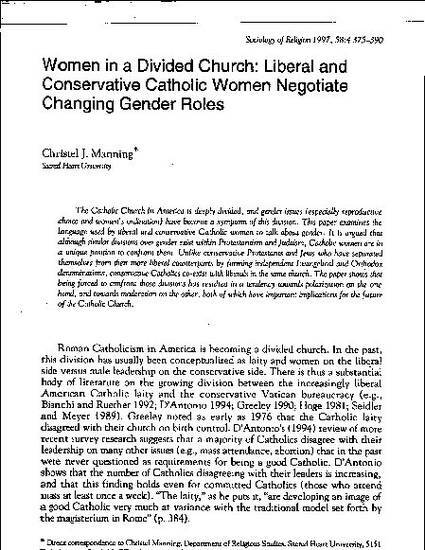 "Women In A Divided Church: Liberal And Conservative Catholic Women Negotiate Changing Gender Roles." Sociology Of Religion 58.4 (1997): 375-390.